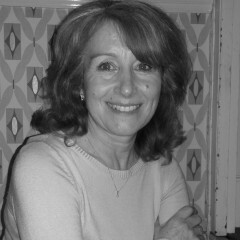 Hello – my name is Carole and I started helping Emily with the Dance School administration last August. I have known Emily and her family since she was a child and saw her dance on many occasions. I know it was her dream to have her own Dance School and I am delighted that this has been fulfilled. I worked full time for the NHS as a medical secretary for many years but recently reduced my hours – leaving me more free time to enjoy my hobbies, such as the gym, gardening and cycling. I am thoroughly enjoying being Emily’s administrative assistant and am looking forward to coming to the next “watching week” when it will be lovely to see the children and teachers and put faces to names! 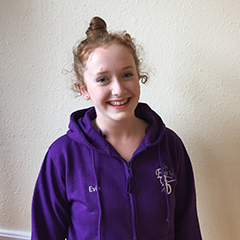 I have been dancing at the Emily Baker School of Dance since I was 12 years old, when I decided I wanted to study GCSE Dance at School. I am currently working towards my Grade 5 Modern, Intermediate Foundation Ballet and Grade 4 Tap Exams and I have just passed my Grade 4 Modern Exam, receiving a Merit! I completed my work experience with Miss Emily earlier this year. After assisting Miss Emily all week I realised how enjoyable I found this aspect of dance. I now assist Miss Emily in teaching Primary and Grade 1 modern on a weekly basis, including helping these children to learn and practise their dance for the upcoming School Production. Working with Miss Emily in this way is helping with my dance and teaching skills, something I want to develop in the future. Hi, I’m Evie and I’m 15 years old. 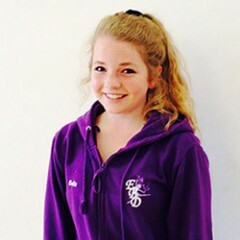 I have been dancing since the age of 7 and joined the Emily Baker School of Dance in April 2016. I am currently learning Grade 4 Ballet and began Grade 6 Modern in September 2016. In addition to this, I attend the PBT classes on a Thursday and have found them very beneficial. I also do Contemporary classes. In addition to dance, I love music and drama! I play the guitar and sing and am currently in an amateur production of ‘Fiddler On The Roof’ which will be performed at the Bristol Hippodrome later this year! In the near future, I aim to attend the Northern School of Contemporary Dance in Leeds. But for now, I am looking forward to participating in the EBD next School Production of Alice In Wonderland and taking on my role as ‘Teaching Assistant’ in the Emily Baker School of Dance.